You may boo and hiss me as you wish. In fact, I fear this information might earn me more derision and disrespect than the time I proudly admitted that I don’t count Amazing Spider-Man Annuals as part of my chase. Because at least with the whole annuals “debate,” I actually believe I’m in the right. 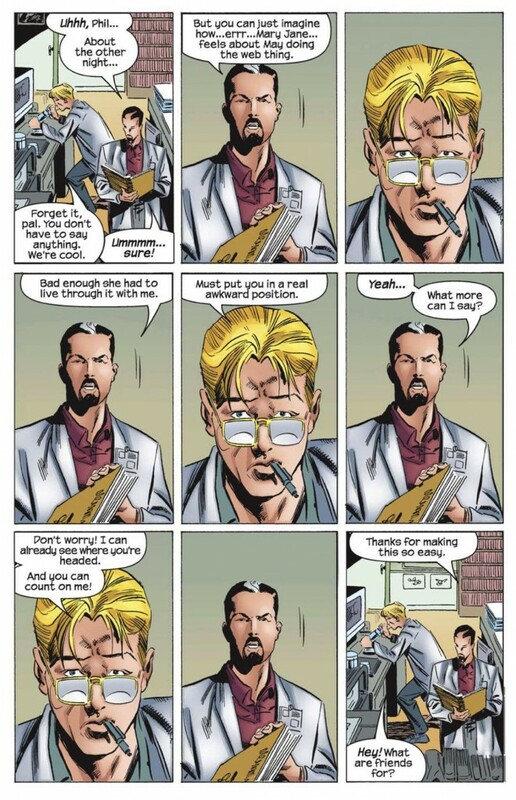 But after reading the first arc of Tom DeFalco/Ron Frenz/Pat Olliffe’s Spider-Girl, I realize that it’s a crying shame that this series has remained such a blind spot for me. Hopefully, when time allows, I’ll be able to binge of all the issues I can find on Marvel Unlimited and move past the shame that this incident has induced. Let me at least attempt to justify why I’ve never read this series: these issues first started being released in the late 90s, which I’ve said numerous times was just a dead period for me as a collector and reader. When I was back in the game by the mid-2000s and saw that there was this Spider-Girl series, I scoffed. As a general rule of thumb, I’ve never been a huge fan of the “girl/woman” equivalent of superhero stories, whether they be Supergirl, Spider-Woman, Batgirl, etc. etc. not because I’m not interested in a book with a female lead but because I have this irrational prejudice that was probably brought on by my exposure to Joel Schumacher’s Batman and Robin the late 90s. But in all seriousness, it’s just a hangup of mine that I have a hard time getting over. When I eventually found out that DeFalco and Frenz played such a key part in this series, I realized this was something I eventually need to check out. Unfortunately, my “to read” pile is mighty steep, especially with all of the lists I’ve been writing as of late for site like ComicBook.com, so again, you just have to forgive me here for just catching up now. In case there is someone else reading this post who is in the same boat as me (you can admit it. I’ll certainly forgive you), Spider-Girl is set in the future in an alternative timeline where Peter and Mary Jane’s daughter May survives the kidnapping/murder of Norman Osborn. Peter is retired from the world of superherodom, and May is living an average teenager’s life until she turns 15 and realizes that she has all of these extraordinary powers. Because of her fine upbringing, May pledges to use these powers responsibly and to defend her family, friends and city as Spider-Girl. Unfortunately, when her parents find out what their daughter is up to, they freak out. 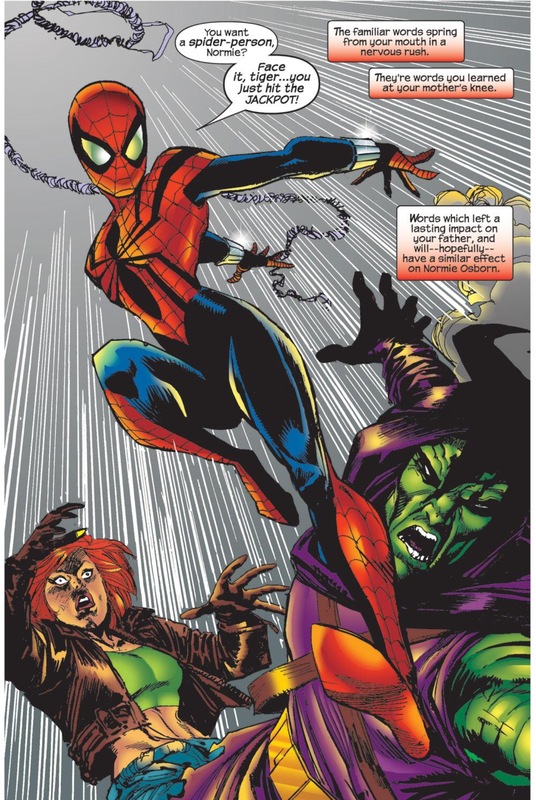 The series is considered a cult hit within the Spider-Man community and even though it never set the world on fire sales-wise, it lasted for 100 issues which made it the longest continually publishing series with a female lead in Marvel Comics history. Of course I can make a comment here about how no other female-led book was given a chance to survive and perpetuate the way Spider-Girl was (you’re telling me we could never get 100 issues out of She-Hulk, Black Widow or Ms. Marvel? ), but I’ll save that conversation for another day. 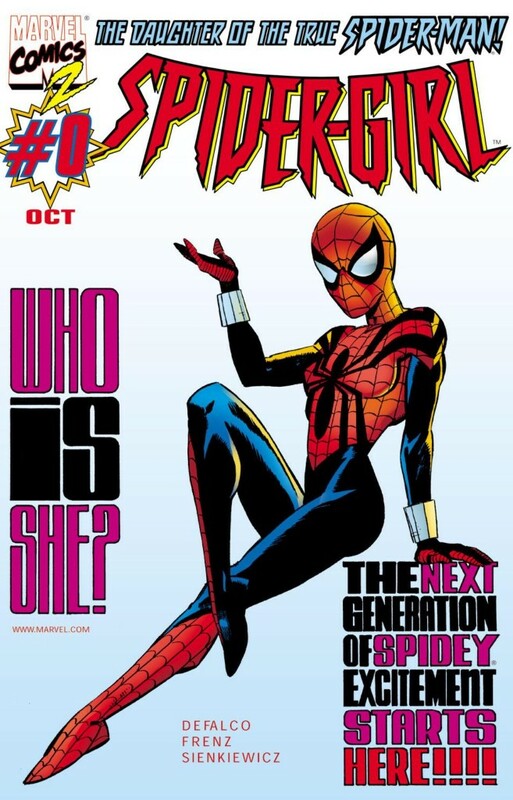 For the purposes of this article – which is not coincidentally being posted on the same day as a comic starring a new Spider-Woman, Gwen Stacy, is being published as part of Edge of Spider-Verse – I took a look at Spider-Girl #0-5, which is basically an origin story/hero gets her feet wet arc which introduces all of the main players, characters and personalities within the book. So if I talk about something that is addressed by a later arc, just forgive me and be a dear and let me discover that for myself once I read further into this series (as I hope to do before the end of the calendar year). There’s a reason why this series is so passionately adored by a segment of the fan base. A lot of it stems from just how good DeFalco is at writing engaging origin stories. As I pointed out when I retrospectively looked back at the “Alien Costume Saga” over the summer, DeFalco has a knack for universe-building while also zeroing in on the elements of a character that attract us as readers. May is the perfect combination of her father’s brains and wits, and her mother’s independence and self-confidence. And considering how wonderfully developed both those characters are in the mainstream Spider-Man books, May is just as likeable and relateable. If the book suffers from anything, it’s that it ever so slightly enters the Dawson’s Creek zone of depicting young characters that are too intelligent and introspective to come across as your “average” teenagers. But it’s a minor flaw that hardly detracts from the flow of the book, or from the thematic meat and potatoes of what propels Spider-Girl’s motor – the dynamic and conflict between May and her parents. While May tries to conceal her extracurricular activities as a superhero from Peter and May, both are too smart to have the wool pulled over their eyes for too long. Peter’s reaction to May’s superheroics is as expected – he fears for her health and safety, especially since, in this universe, he lost his leg in his “final” battle with the Green Goblin. But beyond being the worrisome parent, Peter also struggles with the idea of being a hypocrite. He at first tells his daughter that he was Spider-Man because he had good reason to be, but once May defends her classmates against a dragon monster crashing through her high school like a Godzilla movie, Peter’s moral outrage becomes moot. Instead, it just becomes a classic conflict of a parent wanting to protect his child, but also coming to the understanding that there is very little he might be able to do to save her from the evils of the outside world – especially when his child has the power to make a difference. Mary Jane’s conflict with May is a little more nuanced. 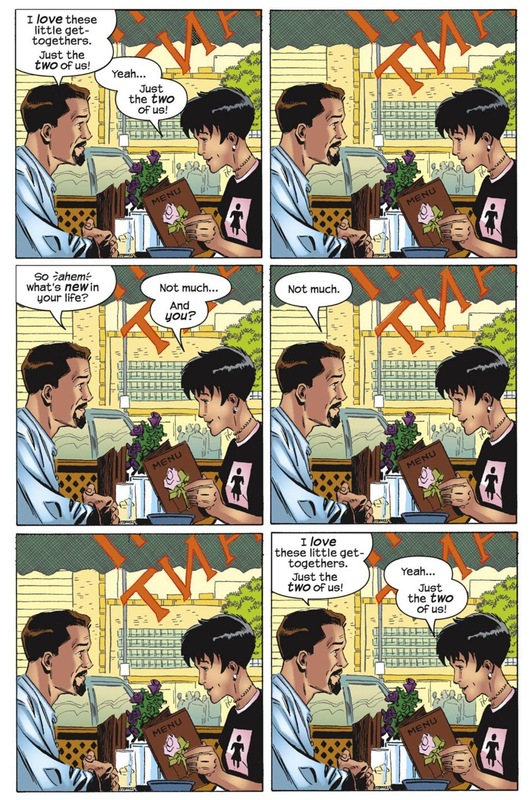 MJ initially comes across as an advocate for May, reminding Peter that their daughter is just going out and doing what he did every day for years. But when May’s superheroics interfere with a family event involving Peter getting an award, the chasm between mother and daughter is suddenly miles wide. It’s like in that one moment MJ is reliving all of the sleepless nights she experienced while Peter was out, risking his life against the likes of the Goblin or Doctor Octopus. To watch Mary Jane instantly transfer that fear and distress to her relationship with her daughter is heartbreaking. On a tangential note, I found myself very fascinated by the use of Phil Urich in this story. 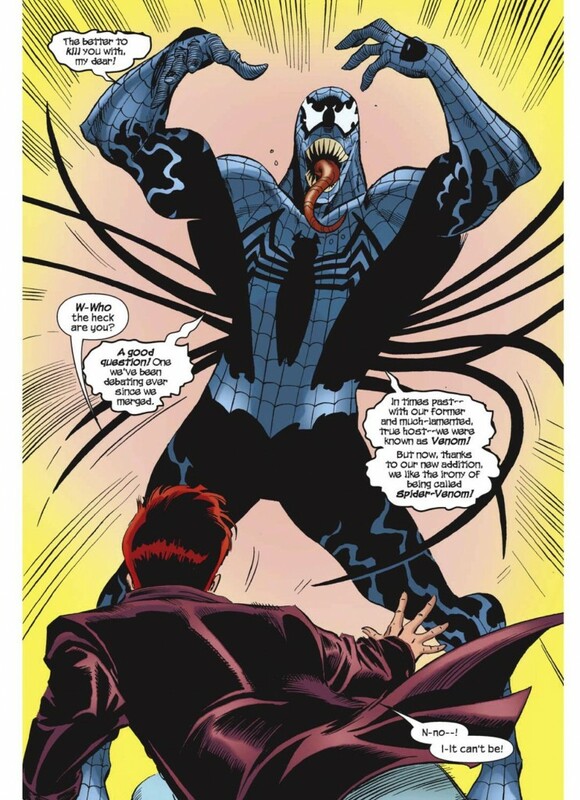 I know that Phil starred in his very own solo Green Goblin series in the mid/late-90s (which I also haven’t read), but reading a Spider-Man book where he’s as critical of a character as Peter or MJ is too mind boggling for me to fully wrap my head around. That’s not a criticism mind you, as the character is extraordinarily engaging as the good cop to Peter’s bad cop with May, but his usage here encapsulates just how different the Spider-books were during this era. For another random observation, I think if I had read these Spider-Girl books about 18 months ago, I wouldn’t have been such an ardent proponent of Normie Osborn being the Green Goblin in Superior Spider-Man. Part of the reason why I thought it was such an interesting idea for Superior was the fact that I thought it was this dramatically new idea and that no one would see coming. Obviously, DeFalco and Frenz thought of it first as Normie becomes the new Green Goblin (and is subdued rather easily by May). Oh well, you win some, you lose some! So after you’ve hopefully forgiven me for this horrendous blind spot on my Spider-Man fandom resume, I’ll be curious to see if the Spider-Gwen one-shot released today can even attempt to match the excellence of the original Spider-Girl story. I personally think whoever came up with Spider-Gwen to be published in 2014 is an absolute genius, especially after Emma Stone’s rockstar performance as Gwen in The Amazing Spider-Man 2. The character is really never going to be more popular than she is in the here and now. My only fear is that Marvel repeats this idea that Gwen Stacy exists only to be killed, as what’s the point of introducing this new character that has the potential to be incredibly popular just to off her like mainstream universe counterpart? Ok, ok, I’ll admit it too. I read only a bunch of arcs from this series. And in the middle of the series too, so I didn’t really enjoy them. But in my case they’re hard to retrieve. What!? How dare you not have…! Nah, I’m just messing with ya. Great to know you liked it. I’ll just say this: I think you’ll be surprised by where DeFalco goes with Normie. Spider-Girl was great! I didn’t buy every issue off the rack but I did eventually get all of them via the digest tpb’s that Marvel put out and then bought the rest. There’s a ton of good stuff in here too! There’s a great cast of characters and sub-plots that stretch throughout this universe. It’s cool the way that universe was created with the 1998 MU in mind and it goes from there. If you can get those digests or the run of this book (and the mini’s it had towards the end) cheap then go for it! I have always wanted to read it and just never been able to get my hands on it! 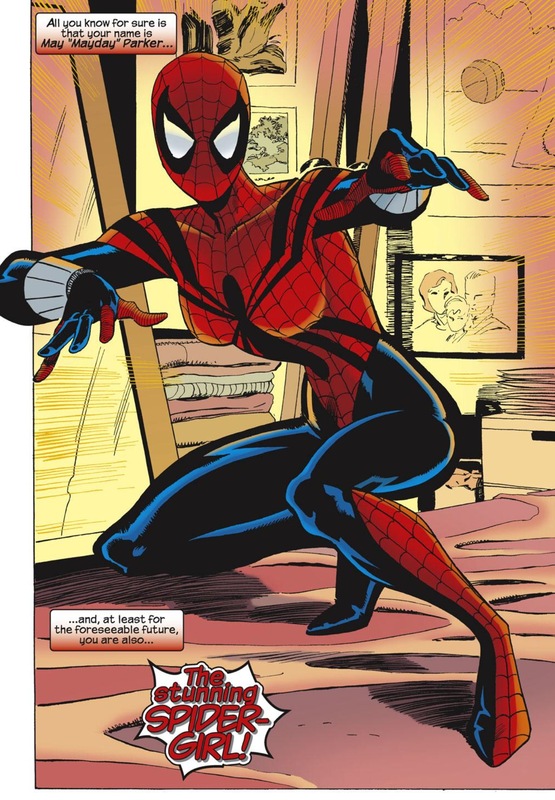 I will say that as of right now I have no idea who is Spider-Girl right now. They should keep up with the character better. Agreed, Mark. I keep hoping Marvel will do something new with the Gwen Stacy character and won’t fall back on the old sword of… well, having her fall on her sword. Figuratively speaking. I’ve never read these books either, but this write-up definitely piques my curiosity. I’ll have to check them out soon! I have enjoyed “Mayday” Parker run and the new Gwen Stacy run. I just hope (like you) that Gwen’s purpose is not to die like Peter Parker’s parents! I personally followed this series since its inception. It is really quite fantastic and engaging, particularly the first 60 something issues. May is a very similar, yet different character from Peter. This makes her an interesting read.